King's Gambit - Chess Gambits- Harking back to the 19th century! The King's Gambit is a popular romantic-style gambit beginning 1.e4 e5 2.f4, in which White aims to displace Black's strong-point on e5, build up a strong centre with d2-d4, and attack Black down the f-file. 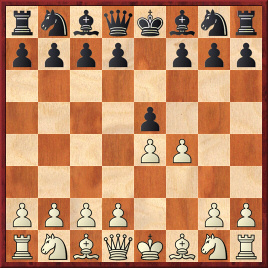 The King's Gambit is especially popular at club level, as it often leads to unusual positions, where White sometimes sacrifices further material (most often the g1-knight) and goes on king walks, but relies upon control of the centre and attacking chances down the f-file to provide compensation. One attraction of the King's Gambit is that even in positions where Black gets the upper hand, White often retains some long-term attacking chances against the black king. In some of the wilder lines White is prepared to sacrifice the knight on g1, or throw in a Bc4xf7 sacrifice, or allow the white king to run around in the centre. The King's Gambit appears to be reasonably sound, with 2...exf4 3.Nf3 and 3.Bc4 offering equal chances with best play, while 3.Nc3 is a dubious but interesting alternative. The main drawback of the gambit is that, particularly in the accepted lines of the gambit, Black has a wide choice of good responses. Falkbeer Counter-Gambit (2...d5) Also includes discussion of 2...Nc6 and 2...d6.